#1 Comedy "Produced by Faith!" WATCH Devon Franklin’s candid interview with SusieQ FitLife! Click image! Meet the man behind the #1 Comedy Movie in America! Devon Franklin! You will soon learn that all of his great work was “Produced by Faith”. SusieQ FitLife had a chance to exclusively interview DeVon at the Hueman Bookstore, during his debut book release & signing for “Produced by Faith!” DeVon opens the flood gates to his personal life and struggles. It may be hard to believe that this young, talented, Hollywood Executive, Preacher & Motivational Speaker would have any challenges in his life. He not only learns how to overcome his hardships, but he is kind enough to share it with all of us, through his words, wisdom and experience on the pages of this spiritual book. 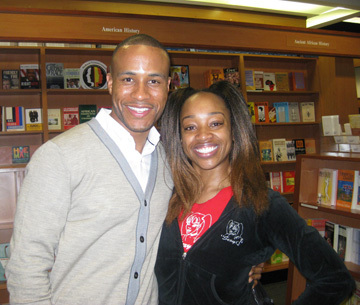 DeVon Franklin & SusieQ @ Hueman Bookstore! DeVon, tells SusieQ about his personal friends, Tyrese & Will Smith. He breaks down the roles they play in his life; along with a few confessions that you will simply have to witness for yourself. Watch DeVon Franklin “tell the truth!” It just might change your FitLife! DeVon Franklin is a rarity: an African-American studio executive at the forefront of Hollywood’s hit machine. He currently serves as Vice President of Production for Columbia Pictures, a division of Sony Pictures Entertainment, making him one of the youngest individuals in that position in the industry, where he recently oversaw the remake of the summer blockbuster, “The Karate Kid, ” starring Jackie Chan and Jaden Smith, which grossed over $350 million worldwide. He also worked on “The Pursuit of Happyness” and Hancock “both “starring Will Smith, the faith-based hit “Not Easily Broken, ” produced by Bishop T. D. Jakes and the family comedy, Jumping the Broom “starring Angela Bassett and Paula Patton. He was formerly a studio executive at Metro-Goldwyn-Mayer (MGM) where he worked on John Travolta’s “Be Cool” and Queen Latifah’s “Beautyshop, “and got his start as an intern for Will Smith and James Lasstier. In addition to his entertainment industry pursuits, DeVon is also a preacher and motivational speaker. He’s a graduate of the University of Southern California and sits on the board of Film Independent and the American Black Film. Carolla, SusieQ & Rush! Armed Challenge!